Make those big beautiful eyes pop with our Blue/black Highlight, Stayzon Black or either the Jet Black or Subtle Black Glosses Just add to the eye as shown. Can be used on the muzzle too. Completely safe for your horse. If you want a more natural finish use the Blue Black Highlight or Subtle Black Gloss. For the Jet black look, either the Stayzon Black with the clear highlight over the top or the Jet Black Gloss. For Chestnut horses we have the Liver Gloss or Liver Stayzon. 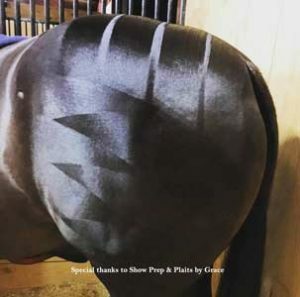 Quarter Marks are fabulous to make your horse stand out if done well. 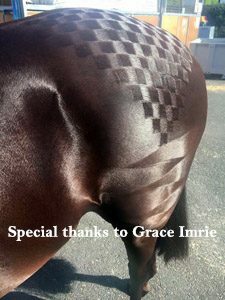 Horses who have great rumps can wear quarter marks well and really stand out from the crowd. 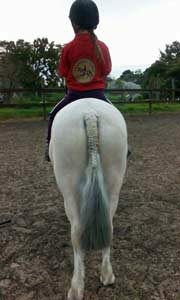 Only ever put quarter marks on your horse once it’s rump has rounded and looks great. 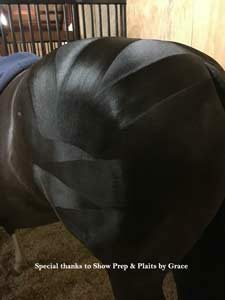 Quarter marks can draw attention to not so good rumps if not done correctly. There are a variety of quarter marks you can use and stencils are available from leading Saddleries. Champion Tails Stayz Put Quarter Mark Spray will keep your Quarter Marks on come rain or shine and will last for ages, until brushed or washed out. 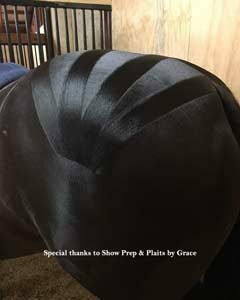 If you have a bay horse the look will certainly be enhanced by blackening the legs if they are not marked well. 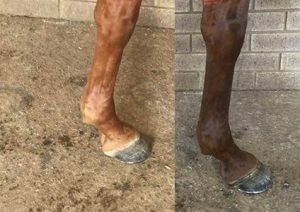 Chestnut horses can also achieve that beautiful leggy look by applying our Liver Stayzon or Liver Gloss. 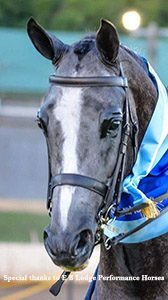 Grey horses can have years taken off them with shading. On the pony below we have added Blue/Black highlight to his legs, muzzle, eyes and shaded his hind legs. Then we added white cover creme to enhance and even up his white socks. 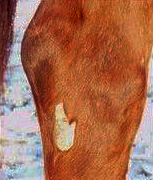 A false mane piece was also added to his rubbed out section of mane. 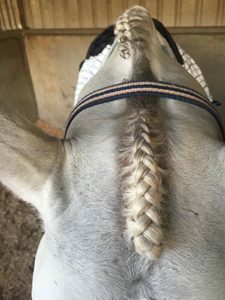 Most horses are plaited on the off (right) side and have an odd number of plaits along the neck and then once the forelock is plaited this makes the even number. 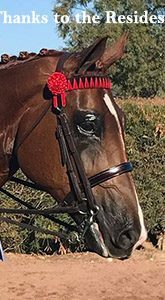 If your horse has a shorter neck you may give the illusion of a longer neck by doing more plaits along the neck and only having a very tiny bridle path, if any. 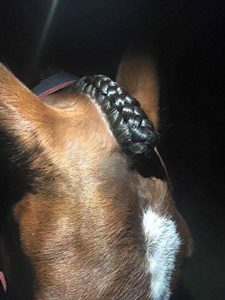 If your horses topline is not so good, larger plaits and even doing the ‘hood’ a little larger can hide a lot. 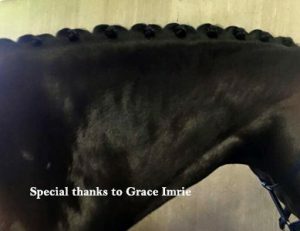 To keep your plaits or bands in without a hair out of place we recommend Champion Tails Stayz In Plaiting Spray. When you take your plaits or bands out after using this the mane will remain soft and silky. 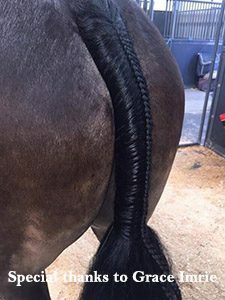 How to know where to trim your horses tails. 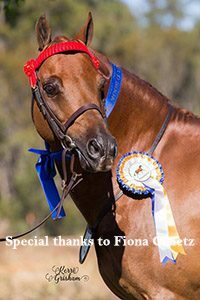 For the Australian Show Horse/Pony the length is usually level with the bottom of the horses Chestnut which is a meaty bit on the inside of the hind leg. They also have them on the front legs. Bearing in mind to allow for the tail carriage of the horse. 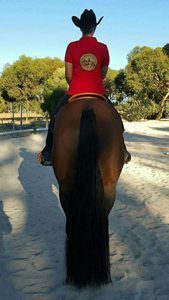 For the Dressage horse the tail is usually in between the Chestnuts and the Fetlock about mid way. Again allowing for the horses tail carriage. 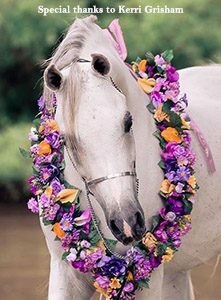 For the Western Pleasure horse they have very long tails. They are still trimmed level at the bottom. 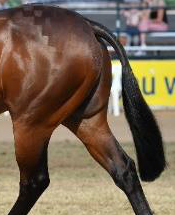 To top off the finish to any horse is a lovely false tail. 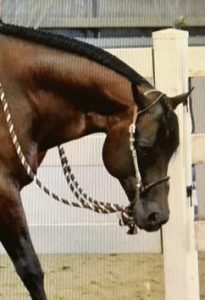 Not many horses are blessed with a lovely thick tail and most have to have a false tail made to match to finish off the overall appearance of the horse. They also hide a multitude of faults. 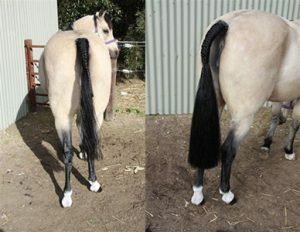 The tail can be enhanced with either pulling the tail or plaiting it.